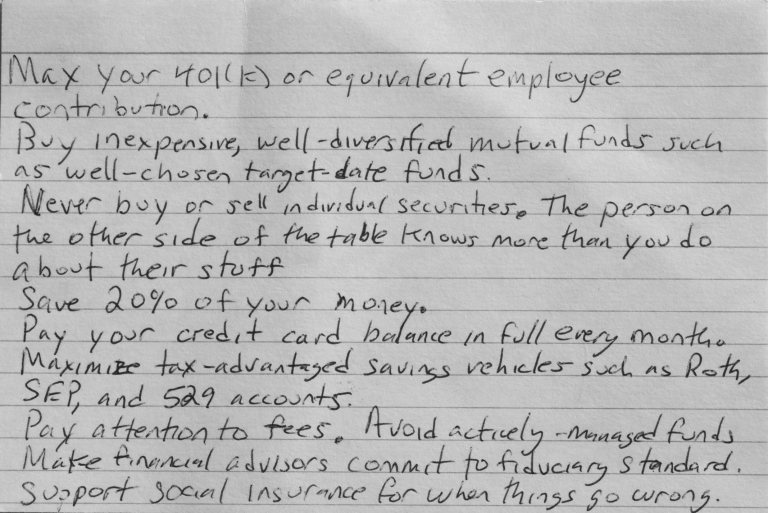 Harold Pollack, a University of Chicago Professor wrote a 3×5 card that gave real financial advice. Most of this information is well known to most people. The problem is that although we have the information, we rarely use it. Going over financial advice may be boring to some, but may save others future hardships. Let’s dig deeper into these no nonsense tips. Employers often offer 401(k)’s to their employees. Maximize yours or at least contribute the most that you can to get your company’s matching contribution. It could be the difference between retiring and living the high life or just getting by. Inexpensive is always better. Mutual funds and Target Date funds are much cheaper than managed funds, so that’s the route you should take. Individual securities should be left to the experts. If that’s not you, stay away. The professionals on the other side know more than you do. Saving 10% used to be the norm, in today’s time it’s 20%. Save as much as you can. When the emergency or opportunity shows up, you’ll be ready. Pay off your credit card balance every month or you take the chance of being a lifetime subscriber to debt. Need to save money on your taxes? Use a 529 account for your kids, a Roth or SEP for tax advantages. Fees can eat into your savings when buying actively-managed funds, make sure you know what these fees are. Fiduciary standards are agreed to by financial advisors to protect you. Make sure your advisor commits to those standards. It’s not if things will go wrong, but when they go wrong. For those hard times support social insurance. If you enjoyed the 3×5 card advice. Here are a few more books you might want to read. The Millionaire Next Door – Thomas J. Stanley wrote this book on how to live the millionaire mindset and to even align yourself with people to include your spouse that can help you attain your financial goals. It’s not necessarily about how to make a million dollars, but about how to have the best financial life you want to have. The Money Book For The Young, Broke and Fabulous – Suze Orman taught us Financial Education on television for years and she’s taken that same great advice and broken it down to help the next generation of consumers and financial investors. If you are young, broke and fabulous; this is the book for you. The Richest Man in Babylon – This timeless classic written by George S. Clason has been an inspiration since the 1920’s for those looking to learn more about personal finance. What makes it interesting is its use of bible parables to make its points. This is a book written for savers mostly, so if this has been a problem for you, this book may be the answer. You may also want to check out some of these great personal finance websites.